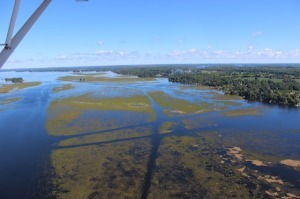 KAWARTHA LAKES – Waterfront homeowners on Pigeon, Chemong and Buckhorn Lakes say struggles with navigation, along with the noise coming from airboat rice harvesters, have led to “an ongoing nightmare” for too long now. They’ve convinced the Township of Selwyn to act. Now Kawartha Lakes is getting in on that too. This issue isn’t a new one for Pigeon Lake waterfront owners. James Whetung, a First Nations member and owner of Black Duck Wild Rice, has harvested wild rice for more than a quarter century. He harvests and collects the rice, and provides an educational opportunity for those looking to learn more about the process. According to his website, the rice is sold through a small-scale commercial operation. But some say it affects their time on the water. Pigeon Lake resident Joanna Augustyniak wrote Selwyn Township stating the harvesting is happening seven days a week, six hours a day. Coun. Heather Stauble spoke in favour of backing the resolutions put forward by Selwyn. Speaking at council on Oct. 10, she said it’s not an issue this council can solve. It needs to be dealt with between the “First Nations” and Parks Canada. 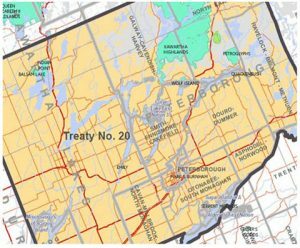 But the City’s resolution to back Selwyn Township will help make it clear this is something that they need to address, she said. Below you will find a link to the Peterborough Examiner re an article titled Prayers, song for wild rice pulled from the lake. This article is filled with inaccuracies, and a response is in order to clarify statements made. In order to view please click on link below, read and then return to original email and click response. Seeding (Planting of rice) Not be permitted. Harvesting by mechanical means Not be permitted. To harvest for commercial purposes Not be permitted. Harvesting by traditional methods for personal consumption and community purposes as set out in the William’s Treaty Harvesting Guidelines is encouraged. I read this article with interest as I am a resident of Pigeon Lake and well aware of the issues regarding wild rice in the Trent Severn Waterways and especially Pigeon Lake. I think it is commendable that a group of people feel strongly about their heritage and culture to put on a demonstration and let their presence be known. However, it is also important when doing so that they ensure they are presenting facts. The following are our concerns regarding the statements in the article and our response to them. CONCERN: The article states that large quantities of wild rice were ripped from the water by homeowners and Mr. Musgrave said he discovered an area of wild rice was missing equaling the size of three Olympic swimming pools. He then goes on to say he witnessed people tugging out more. RESPONSE: The people he says he witnessed were pulling rice from around their dock. The amount of rice pulled was minor. It is a fact, a lot of wild rice has been ripped from the bottom of the lake floor, but the cause was the high winds and rough water we have experienced in the past week, not human hands. Wild rice is currently in the floating stage of its life cycle, which is when it is most vulnerable to damage. CONCERN: Mr. Musgrave stated that the permits issued last year to some shoreline owners were revoked and that the permits were not intended for wild rice, but for seaweed-type plants. RESPONSE: There was one permit that was issued specifically for the removal of wild rice for multiple properties, which the shoreline property owners honoured. The permit was not revoked as the shoreline owners voluntarily suspended cutting, as a sign of good faith in the future consultation between Parks Canada and the First Nations. CONCERN: Mr. Musgrave’s statement that the agreement with Parks Canada and TSW to clear certain areas was made in good faith to build peaceful relationships. RESPONSE: It is true that Parks Canada and the First Nations are in consultation and it is encouraging, according to Parks Canada. They advised, in an update of the talks, that progress is being made in finding solutions that will satisfy the needs of all users of the lake. However, there has been no release of information, to date, that an agreement has been reached to clear certain areas. COMMENT: There have always been small rice fields in Pigeon Lake, which were not a navigation concern, until Mr. Whetung of Curve Lake admittedly took the liberty of seeding the lake, causing a proliferation of wild rice. He also harvests these newly “planted” fields via a noisy airboat. His commercial operation is in violation of the Williams Treaty Harvesting Guide, which clearly states that the wild rice harvest is to be used for personal and community use. It is important to note: The original rice beds on Pigeon Lake for more that 70 years were less than 200 acres. Now, because of the thousands of pounds of seed that Mr. Whetung admitted he has planted, the rice on the lake now totals between 1200 and 1500 acres. This new measurement has been documented in a recent study. The proliferation of rice over the past years has encumbered navigation, lowered property values, restricted recreational activities including swimming, fishing and tourism. The proliferation has also caused and increase in the amount of rice floating into shore which property owners need to remove – and to top it off, a fee is now being charged to take it to the dump. We have always taken the position of respecting and honouring First Nations rights. We believe in a conciliatory approach, taking the needs of First Nations, shoreline property owners and all Canadians into consideration. Working together, solutions can be found to meet the needs of all users of this once pristine waterway. I am sure that the demonstration on Sunday, July 24th, 2016 was intended to show loyalty and commitment to their beliefs, which they achieved. However, it is also important to ensure all facts are presented fairly and to understand that we also have a culture, which should be respected as well. Please visit our website www.savepigeonlake.com for details and a better understanding of the issues.